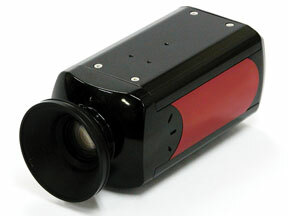 The V-C310-HDSDI box camera has superior quality high resolution video up to 1920 x 1080i. The HD-SDI interface allows transmission of high definition video up to 200 meters over standard coaxial cable. The V-C310-HDSDI box camera is designed for superior quality high resolution video up to 1920 x 1080i. The HD-SDI interface allows transmission of high definition video up to 200 meters over standard coaxial cable. An F1.8, f=4.5 to 45 mm 10x optical zoom lens along with 12x digital zoom combine for up to 120x magnification. All this is packaged in a small, sleek aluminum enclosure. A 1/4"-20 mounting receptacle may be attached to either the top or the bottom of the enclosure. This along with horizontal and vertical flip allows easy mounting for almost any POV location. Weight 1 lb. Dimensions 2.6" x 2.4" x 5.5"